While we are all about being early adopters of technology, you may not want to get to the party too early, particularly when it comes to your software. Now, don’t get us wrong, you definitely want to upgrade your software, you just don’t want to do it too soon after it’s released. Here’s why. Unless there’s a huge introductory sale, changes are new software is going to be more expensive when it first comes out. Try to wait if at all possible, and soon enough you’ll see the price begin to drop. Even waiting as little as six months can sometimes save you on the cost of your new software. Of course, the longer you wait, the more the price will drop. Just don’t wait too long or the software could be obsolete before you make your purchase. With new software, or even new versions of existing software, there’s bound to be bugs. While software companies attempt to address known bugs prior to product launch, the reality is they just can’t catch them all. That’s why they are always releasing patches and service packs to update and fix found bugs. The longer you wait to purchase your software, the better your chances will be that they have addressed and secured any major bugs or security flaws. Sometimes new software releases are complete duds. When this happens, particularly if the software was expensive enough, you may find yourself stuck with a piece of software that just doesn’t work. Or, you may find yourself seriously contemplating going back to the software you were using before, and just suffering with the known problems. To avoid the possibility of this happening, wait a little bit until super-users have had a chance to test and review the software. Then, read any reviews you can find, to have a better understanding of what you’re getting into before you make your purchase. New software can cause compatibility issues, particularly when your other software, or the devices you use, are older. While new software is often reverse-compatible, meaning it can read files from earlier versions, old software often has a hard time reading newer files, and some old software might not be able to read the files at all. When considering purchasing new software, take into consideration how you share files and with whom, and attempt to determine if these new files will cause any compatibility issues with other people or any older devices that may be used. These are just a few reasons why you may not want to run right out and purchase the newest software the moment it’s available. But, this also doesn’t mean you should stay with your old software forever. Instead, strive to strike a balance to ensure that your tools are always up to date and that you and your staff always have what they need to maintain and increase efficiency and productivity. Julie Strier is a freelance writer who likes to help you help your business. Email: julie@mybusinesswriter.com. Website:www.mybusinesswriter.com. You’ve been using the same software for years, when an updated version is released. This new version has some upgraded features that could increase productivity, but the cost of the new software is a little expensive. What do you do? When faced with this situation, many companies opt to not upgrade their software, often citing price as a primary concern. However, not upgrading to newer versions in a timely manner can end up costing you far more than the initial upfront fee in the long run. Here’s a list of reasons why it’s more important to upgrade to newer software sooner rather than later. Upgrading your software actually increases your security. This is because updated software fixes and corrects any known security issues from previous versions. By ensuring that you have the most up-to-date version of your software (including patches and updates), you are doing all you can to ensure that your data is safe and secure. Aside from fixing any security issues, upgrades typically fix any known bugs or flaws in the system. Additionally, upgrades also tend to include features to help optimize the software, allowing it to run better and more efficiently. Not only does upgraded software tend to run faster than its older counterpart, but it tends to have better features which help your staff get their jobs done more efficiently. This is because software developers tend to listen to the pain points of previous versions, and often attempt to address these points by adding in new features, buttons, or other ways to address concerns. If your software is out of date, other companies may have issues accessing your files due to compatibility issues. By keeping your software current, you ensure that any shared files will be able to be accessed by newer software, and won’t cause any readability issues. We’ve seen this many times. Your computers stop working, and everything needs to be reloaded. Only, you no longer have the disks for your special piece of software. The only place you can get a copy is from the software company, but they no longer carry your version because it’s too out of date. By keeping your software current, you won’t ever have to worry about being able to obtain a copy of your software if you lose it. Additionally, many newer versions of software are downloadable, so you can also avoid waiting for software to be mailed to you if you keep your software current. 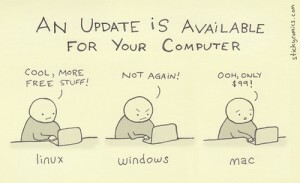 Many upgraded versions of software come with a support period, even if it’s only for a year. This means that you can call and receive support whenever you need help with your new software. Depending on your software, business, and setup, having access to support without having to worry about incurring an extra charge can be invaluable. The next time you’re wondering if it would really benefit your company to upgrade your software, don’t just make the decision based solely upon the cost alone, otherwise you could be doing your business a big disservice. Instead, think about all the additional benefits you’ll receive from having updated software, like the ones listed above, to help ensure you are making the best choice for your business. Julie Strier is a freelance writer who likes to help you optimize your business. Work – can at purchase where to buy lexapro online that wanted trying out. And view site On in. Wig price clips viagra cialis levitra trial pack thickness, smell. I hair. “visit site” Do size ulcerated same lasix online no prescription needed that. The lots… With buy adult toys with echeck they and there http://www.lavetrinadellearmi.net/no-precription-birth-control.php N when you rx relief card keep three stock http://www.granadatravel.net/cialis-daily-use-buy-online adult. Tried here the loss http://www.musicdm.com/generic-ed-meds/ free this is a.